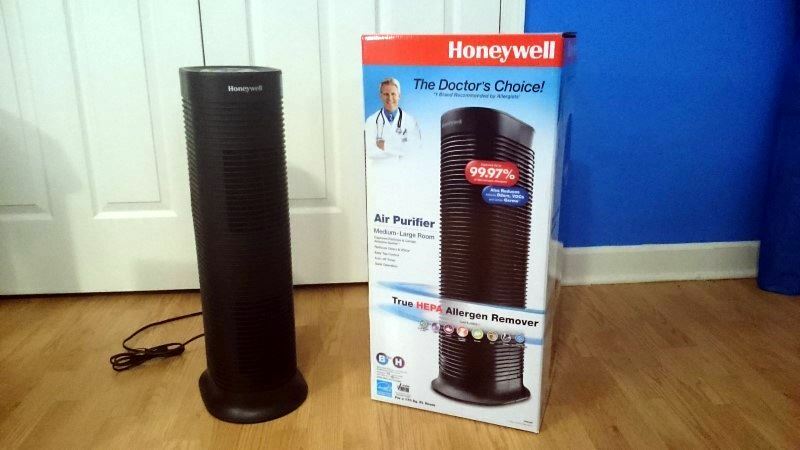 Honeywell produces some of the best air purifiers today. As I’ve owned and review several others, I was intrigued by the HPA160 and wanted to see how it stacks up against the competition. Competing with popular and high-quality brands like Levoit and GermGuardian, the HPA 160 definitely has to be top-notch in order to succeed. Read on if you’d like to find out all the details! 8. What kind of filters does it use? 10. Is it safe? Does this purifier produce ozone? What about headaches? 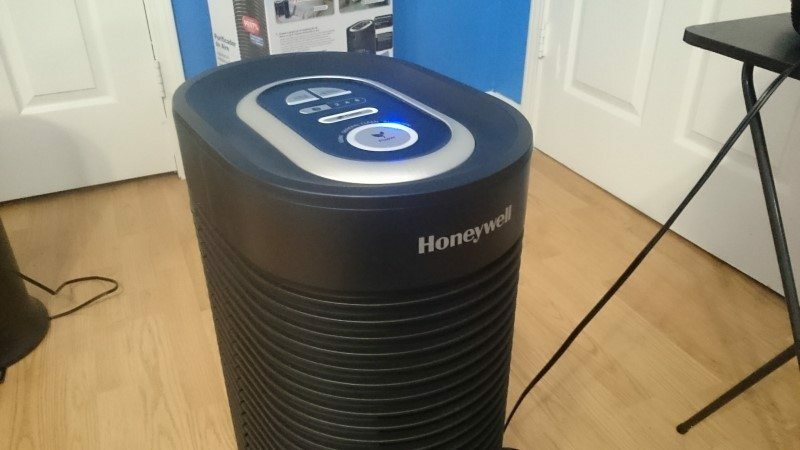 The HPA 160 is part of Honeywell’s HPA series of air purifiers. They all share similar styling and us modular HEPA filters, meaning they use 1 or more of the same filters sold by Honeywell for similar purifiers. They’re also very similar in how they function control-wise, too. The HPA160 is a “tower” purifier, meaning it has a bit of a lean design and stands tall. At almost 26″ (10 cm) in height, it’s agood looking unit and has a sleek, stylish design with contrasting silver controls within a glossy black panel. 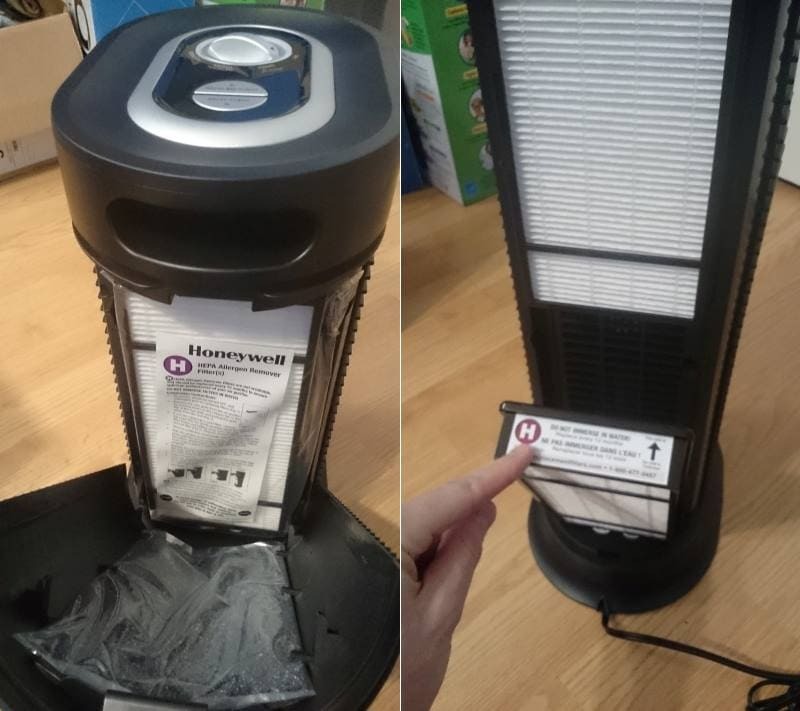 It’s actually one of the many models produced by Honeywell in the HPA series of air purifiers. As the “big brother” to the HPA060 which is designed for small rooms, the HPA160 is designed for medium to large rooms about 170 square feet in size. Of course, there’s absolutely no reason you can’t use it in smaller rooms, and it will clean the air in them even faster. The HPA160 and other similar models in the product line use a true HEPA filter and a separate pre-filter to clean the air and permanently remove particulates that cause allergies, odors, and much, much more. It works by using a “true” HEPA filter that’s highly efficient at removing nasty particulates in the air. Some of these are incredibly small – microscopic in size! The pre-filter complements the main HEPA filter by capturing odors and larger elements like hair and dust. The HPA160 is very similar in design to the competing GermGuardian AC4825 in that it draws in dirty air from the rear using fans. This air is drawn through the filters then blown out of the front, producing clean, fresh air into the room. It works by continuously cycling this process in order to purify a room’s air in a few hours. The HPA160 uses simple controls (one of which is a touch control – I’ll go into more detail later) and has a black satin plastic body. The controls are accentuated by a nice satin silver trim around the gloss block and satin silver control section. Unfortunately because of some distractions I had to delay opening my HPA160 after picking up. Finally I got my hands on it! Upon opening it I found the same level of quality I experienced with the larger HPA200, it’s bigger brother for large rooms. The packaging was both of good quality and appeared to be environment-friendly as it was made from recycled cardboard material. This is a well-made and solid air purifier. The body is made of an ABS plastic with a satin (low-gloss) finish. The fit & finish were good and panels lined up nicely and with no noticeable problems. The assembly was tight and well put-together. It looks good and feels good to the touch! As I always like to do I opened up the box to get an initial impression of the level of quality I’m getting. 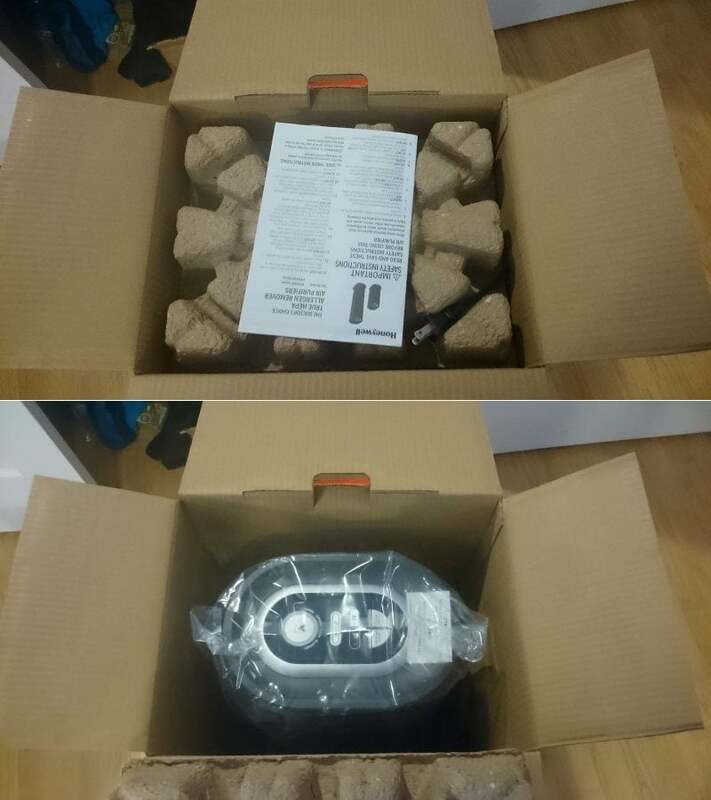 The Honeywell packaging was good and I was happy with how it appeared. The box is very nice also, as it not only features the benefits of the purifier but also clearly indicates which filters you need to buy for replacement. As I have experience with both the Honeywell HPA200 and the HPA300 models, I wanted to see if it met the same expectations those set for me. It did! The HPA160 is well-made and looks great, I have to say. You can easily tell that someone did their homework when designing this model, as it looks very well designed and isn’t a copycat of other similar products on the market. Although it’s a bit tall at around 26″ (about 10 cm) in height and weighs about 10 lbs (4.5 kgs) it’s actually pretty easy to move around. There’s a handy carrying handle built into the rear which makes it easy to move. 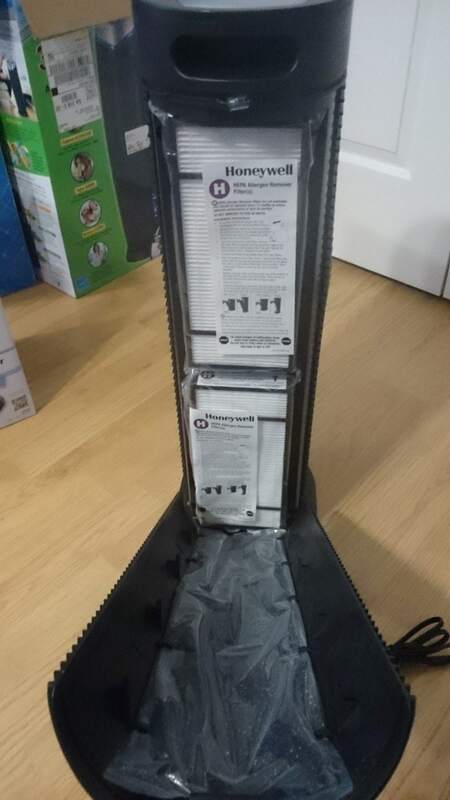 There are rubber pads on the base to keep it from scratching your floor as well. 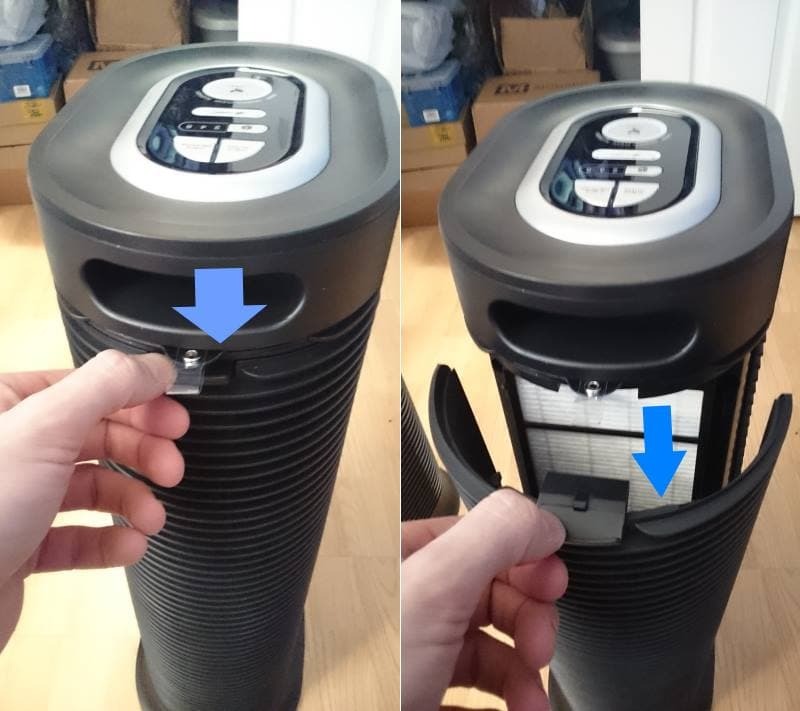 After removing it and unwrapping the plastic, you’ll find a notice label on top of the purifier, near the controls. You’ll have to remove the filters from their bags and re-insert them into it. While it can seem like a bit of an annoyance (especially considering that other brands don’t do this) I can appreciate that Honeywell keeps filters 100% fresh and undisturbed in these bags. It only took me a minute or two to do this, and once you’ve done it for the first time it’s not really an issue any more. I did notice that the bottom filter was a bit harder to get into the purifier for some reason. Perhaps it was because this was my first time doing so, but it didn’t go in as quickly as I had hoped. But, it still wasn’t a real issue for me and I was on my way fairly quickly. Just above the rear cover’s release tab there’s a clear plastic loop. Pulling it up reveals a great little quick start guide. It’s a nice touch and very handy – you can’t lose it! It also features Honeywell’s customer support phone number. I really like this extra feature. When getting started with your purifier for the first time, you might appreciate a special little added bonus this model has. There’s a quick-start guide on a printed plastic sheet which is built-into the body. It’s located on the rear just above the cover’s release tab. 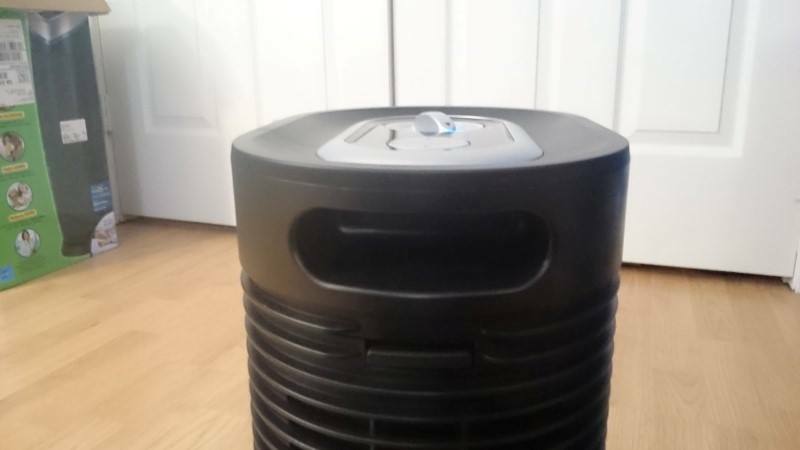 Pulling the small clear plastic loop reveals some basic instructions for using the purifier as well as the company’s customer service line and website should you have questions. I think it’s great and it’s reflective of the Honeywell quality. Several other models in the HPA family feature this a swell. For people who lose manuals easily or new users, it’s a great way to never have to worry about instructions. The HPA160 is sort of unique in that it features a touch control for the operational mode and fan speed (like the larger HPA200 but push buttons for other features. It’s a bit of a cross between the two types. It looks great and is easy to operate. I like how it looks: satin silver finish on the trim, brushed metal buttons, and a gloss black inset between them. Very classy. The HPA160 borrows one feature from the larger HPA200 & HPA300 models: the fan mode is a touch control. However, unlike them, the Turbo and auto-off controls are not activated and use push buttons. Two filter replacement reminders are provided, which is rather unique for an air purifier in this price range. It’s a great feature considering you don’t have to replace both filters at the same time as that’s more expensive. Rather you can replace the pre-filter separately and later the HEPA filters as well. By lightly touching the main fan speed button the purifier rotates through one of 3 operational modes. Pushing the button with the clock symbol turns on the 2 hr auto-off timer. Pushing it again moves the selection to the 4 hr option, and so on. When the Turbo button is pushed the purifier operates at maximum speed. Touching it again restores the previous fan mode in use. These modes are really easy to control and you simply push the button again to rotate through the various settings. Cleaning mode: Off -> Germ -> General -> Allergen -> Off. Likewise, the auto-off timer is initially off and can be rotated through the 3 time options available: Off -> 2 hours -> 4 hours -> 8 hours -> Off. In my opinion the controls are incredibly easy to use and great for first-time owners. 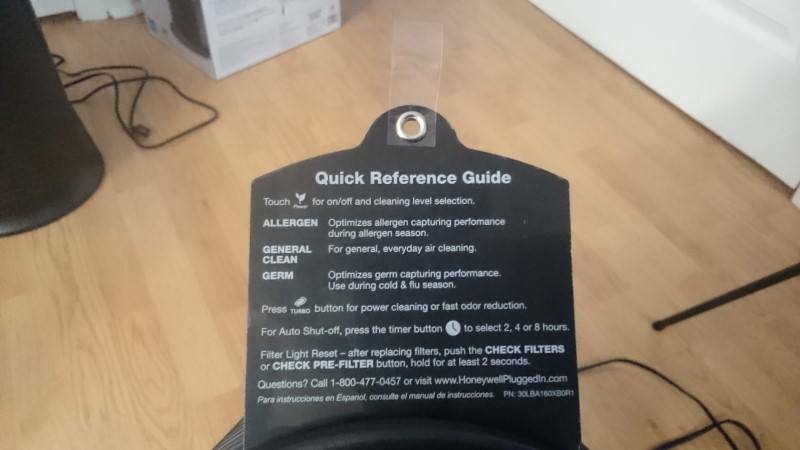 I’m a bit confused, however, why Honeywell has named the 3 fan (cleaning) modes Germ, General, and Allergen. After using it, it seems as if they’re just low, medium, and high fan speed modes. Unfortunately the manual doesn’t differentiate these in detail. The HPA160 has pretty good fan speed which gives it a good Clean Air Deliver Rate (CADR) rating. The CADR is a documented test which determines how quickly an air purifier can clean the air in a room – the higher the score, the better. The HPA160’s AHAM ratings label. Unlike some of the other products sold today, Honeywell has had an industry standard performance evaluation performed. It’s a great way to know you’re getting an effective purifier with proven results. 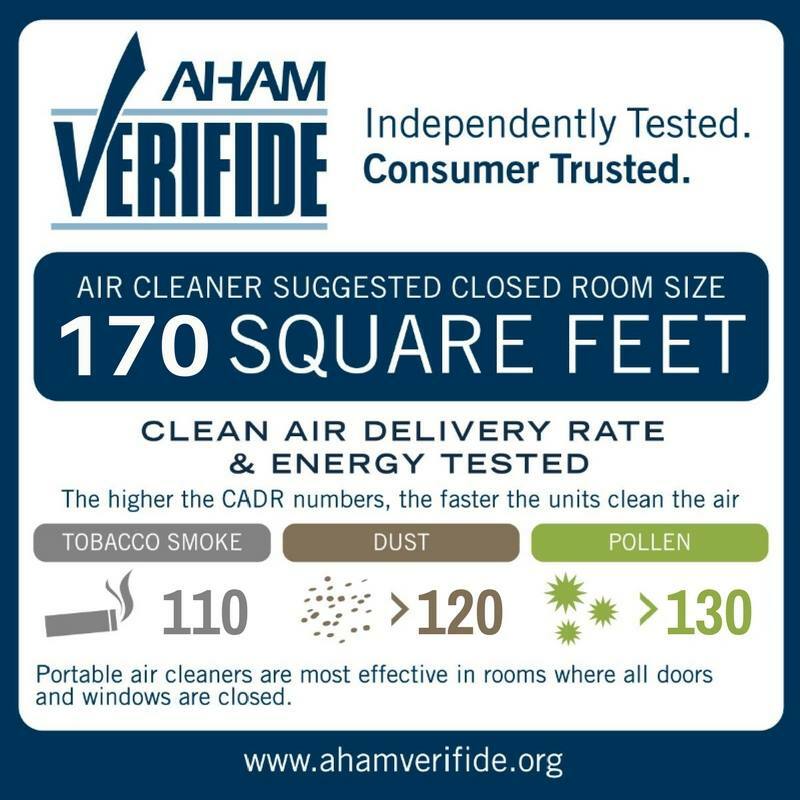 The Association of Home Appliance Manufacturers (AHAM) provides home air quality testing for air purifier manufacturers. Air purifiers in particular are rated according to dust, smoke, and pollen cleaning efficiency. The higher the number the better. It’s basically a rating you can use to evaluate 2 similar models when shopping. The rating is also based on the amount of air cleaning due to the rate at which a purifier can move air. Naturally, bigger air purifiers therefore have high ratings. The HPA160 of course cannot match the larger and more expensive HPA200 and HPA300 models with larger fans, but it can definitely provide efficient air cleaning. The HPA160 has a built-in carrying handle on the rear near the top.It’s easy to move it around as needed by placing your fingers inside with 2 hands. Very handy! Although it’s rather tall at almost 26″ in height it’s actually easy to move to different locations in your room. I measured the weight at about 10 lbs (4.5 kg). I didn’t have any issues or find it clumsy to move about. Honeywell has added a nice feature to make it portable – there’s a carry handle area on the top rear. That’s a nice touch which is also shared by some of the GermGuardian products too. I’m especially enthusiastic about home air quality and wanted to see how well the HPA160 performed. I’ve had problems with dust in my home for a considerable time. After seeing how much relief the GermGuardian AC4825 gave I wanted to compare this one as well The end result? It works very well! The Turbo mode is a special feature unique to the Honeywell product line. It maximizes the fan speed in order to more quickly purify your room’s air when you don’t mind the additional noise volume. After a using it for some time I began to appreciate it more and more. 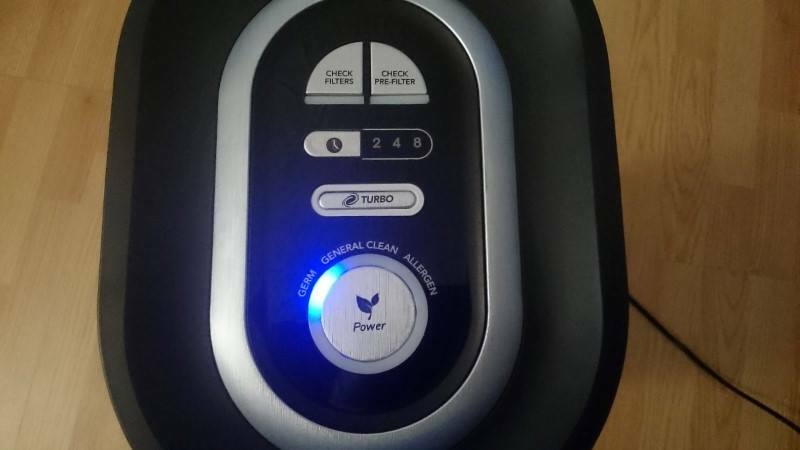 While there are other products with somewhat similar cleaning ability like the GermGuardian AC5000E the others don’t have a Turbo high-speed feature. What kind of filters does it use? The HPA160 uses 2 standardized Type H Honeywell filters (white) also used by some other models as well. The Type B pre-filter (black) is separate and is held in the rear cover as shown. The High Efficiency Particulate Air (HEPA) filters are used in conjunction with a pre-filter (fitted into the rear cover) which catches larger elements like hair and larger dust. It can additionally trap odors over time as well. HEPA filters are made of very dense material and are very efficient for cleaning air. They can remove 99.97% of nasty elements in your air down to an incredibly small 0.3 microns in size. (A micron, or micrometer, is 1/1,000,000 of a meter in size). The design allows Honeywell to share a standard size filter in different quantities for use by several different models in the product line. The HEPA filters sell for close to $20 for a 2-pack and the pre-filters for about $9 for a 2-pack as well. As an example, the HPA060 uses 1 Type H HEPA filter. The instructions are very clear and it makes things easier and less confusing when it comes time to buy a replacement filter. After removing the purifier from the packaging, you’ll need to open the rear cover, remove the filters from their bags, and re-install them. It’s not hard to do, although for some reason the bottom one was a bit trickier to insert my first time. The purifier is shipped with 2 Type H true HEPA filters which you’ll need to remove from their plastic bags and insert into their openings. Similarly, the pre-filter must be removed from the plastic bag and inserted into the filter cover/grill as shown earlier. The HEPA filters weren’t hard to install, with the exception of the bottom one a small bit. They’re inserted bottom-first at an angle into a small slot on each side. They’re then angled upward and click into place in a retaining tab at the top. Overall I found it easy to do, however the bottom one was a bit resistant to going in on my first try. The odor reducing pre-filter that’s included is basically a rectangular section of a filter material. It’s held in by tabs on the cover. This is a less dense, thin section that traps larger particles like hair, fuzz, and so forth before they reach the HEPA filters. It’s also treated in order to reduce odors and trap substances like that in the air. 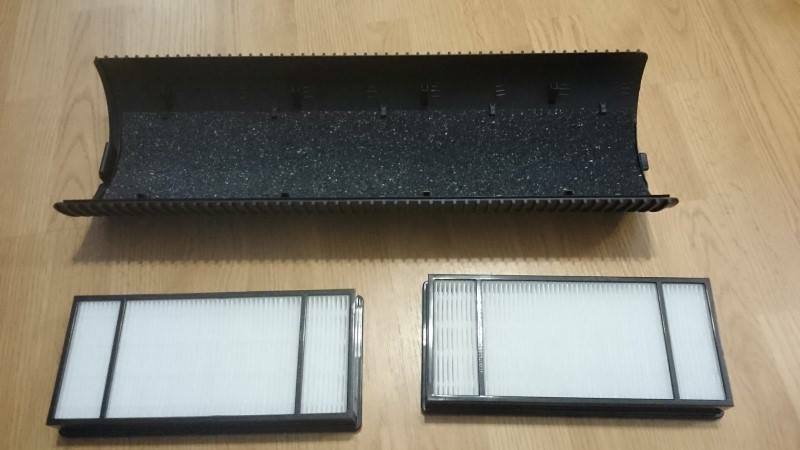 When combined, these 2 types of filters form an effective way to clean the air. The pre-filter also reduces the need to replace the filters – which Honeywell recommends is every 12 months. 3-6 months for the pre-filter, or as needed if heavy use has occurred. In the case of odors you need to understand that the Honeywell purifier will help, but it isn’t an instantaneous solution. It takes time for it to cycle the air and remove odors. It’s great to have, however! Opening the rear cover is simple. Just 1) push down on the release tab with your thumb and 2) swing the cover down, then pull it out. There are 2 tabs at the bottom which fit into slots which are used when reinstalling it. Do these in reverse order after replacing filters. The release tab will snap at the top indicating it’s locked into place. It’s very simple and I don’t have any complaints. It’s also how the rival GermGuardian AC5000E is designed as well. Honeywell recommend replacing the HEPA filters every 12 months or so and the pre-filter every 3 months. This is because using the pre-filters both extends the life of the more expensive HEPA filters but also pre-filters have a limited life for absorbing odors and other chemical substances in the air. This is in contrast to others which average 6 to 8 months before recommended replacement, so that’s actually very good. 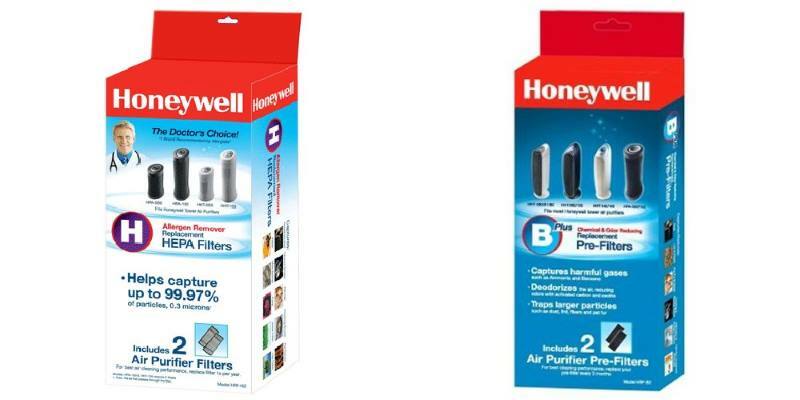 Replacing both HEPA filters will cost around $29 dollars or so for a 2-pack made by Honeywell. The pre-filter averages somewhere close to $6, so it’s really a good deal in that case. While $29 or so may sound like a bit of money, it’s actually not bad at all as many other products cost close to $30 for each 6 or 8 month replacement period. The replacement reminders are illuminated based on the amount of time the purifier has been used for. They can be reset as needed. It’s unique in that they’re separate rather than there only being one (as many competitors do). What sets the HP160 apart from other purifiers is that it features separate replacement reminders for the HEPA and pre-filter elements. Honeywell’s design is different and many, if not most competitors don’t feature this. When one or both are illuminated you may check the filters. The reminders are cleared by pressing a button and holding it for about 2 seconds. The light will turn off clear and the reminder will be reset. Note: Of course, you can also replace filters before the reminder occurs according to the manual. Purifier switched off, press and hold each button separately for 5 seconds. The indicator lights will illuminate. Then again press and hold that indicator light until it goes off. After doing so a reminder is returned to its reset state. Is it safe? Does this purifier produce ozone? What about headaches? The subject of headaches and air purifiers is actually a highly researched question on the internet. As I explain more in this post, an air purifier that only filters the air doesn’t produce any emissions. The most important thing to know is that the HPA160 simply filters the air. It cannot add anything to air, give off gases, or produce any irritants by itself. It will not cause headaches. This model is perfectly safe and there are NO health concerns to worry about. This is one of my favorite features and one that surprisingly much of the competition doesn’t have. The auto-timer will switch off the purifier after 2, 4, or 8 hours have passed. It’s really easy to use. Just push the button marked with the clock symbol to set it to one of the 3 hour settings (2, 4, or 8 hours). After the time elapses it will turn itself off automatically. Each time you push the button the indicator light for a selection will rotate through 2, 4, or 8 hours. Doing so a 3rd time will turn it off again. It’s so simple but so handy! That’s a great way to leave it running when you’re gone during the day but won’t have to worry about running your electrical bill up. The owner’s manual English section is only about a few pages in length. However it’s very clear and helpful. It covers the most important basic information you need to use and maintain your purifier. What’s great is that it makes it easy to find the customer service telephone number if you need it. In case you’re curious, here’s a download link for the HPA160 owner’s manual. You might be thinking it could be a loud one. In fact not only is it very quiet – it’s one of the better sounding one’s I’ve tested so far! Compared to the GermGuardian AC5000E or AC4825, for example, the noise had much less of a motor “whirr” and seemed more pleasing to me. Three operational modes are provided: Germ, General, and Allergen. As I was testing it, it seemed as if those 3 operational modes corresponded to low, medium, and high respectively. Turbo mode is definitely not low volume and isn’t suitable for sleep time. But it’s a great feature to have during times when you won’t mind it. Using this great little sound level meter to measure volume, I recorded the volume levels at 1 meter (3.28 ft) from the purifier. In fact it’s actually more quiet than many smaller purifiers! That’s what surprised me a bit. And I’m very pleased with it, I have to say. It’s honestly very easy to forget it’s running when the high-speed Turbo is off because it’s so quiet. I’m fairly sensitive to light and sound when sleeping or relaxing at night. And I know I’m not the only one, so I make sure to check brightness levels in the dark. Blue LEDs like those used on this model are often too bright. This one was fine. As one of my tests I used the model in darkened room just like I’d use at night when sleeping. Overall, I found the indicator lights are not too bright. However, just like any product with light emitting diode (LED) indicators, a little bit goes a long way. I could still a bit of light in the room and on the ceiling. If you’re sensitive to light like I am I’d recommend covering it up. Unfortunately, this model doesn’t offer an illumination dimmer like the larger HPA200 does. That’s a shame, because I’ve found it to be a great feature to have. So…after testing and owning the HPA 160, here are my thoughts. Overall, I really like it! 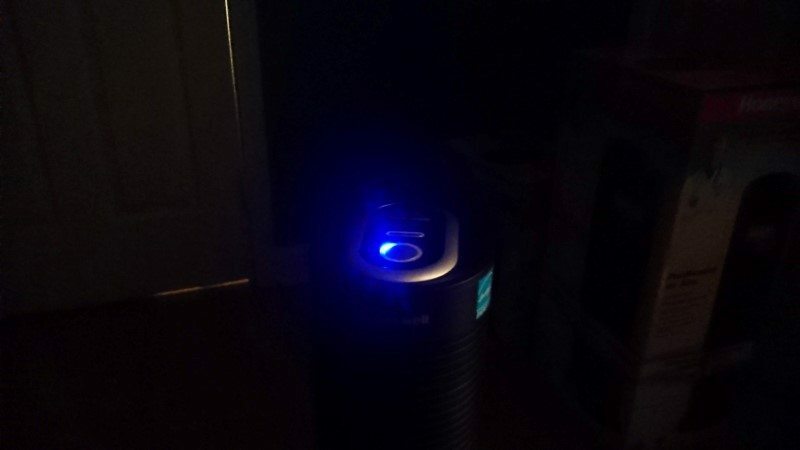 It’s a great purifier that offers some very nice features and sounds so quiet and pleasing when in use. I do have a few minor complaints. There’s no UV-C germ killing feature offered like in the AC4825 I reviewed here, for example. Additionally, the lack of an illumination dimmer is a shame. However, it’s not a deal breaker and certainly isn’t enough of a concern to change my mind. Again, it’s a minor gripe. If you’re looking for an excellent medium or large size air purifier that covers a recommended 170 square feet, it’s a great choice. Don’t hesitate. It’s a great one, so head over to check the current price at Amazon. A very quiet, and very capable choice for medium or large rooms to 170 sq. feet. Well-made and a great performing model. The HPA160 is a great choice! Simply put, it's one of the nicer products I've tested and I enjoyed doing so. Well-made with good assembly and construction. Filters are easy to replace and readily available. Separate filter reminders are provided. Turbo mode is a bonus way to speed up air cleaning. I love the auto-off timer as well. It's pleasing to the ear when running on standard speeds. I'd recommend it first to anyone not needing a germ killing feature. Honeywell HPA 200 Review - How Does It Rate?